Hello friends!! Another soggy day here in the northwest. 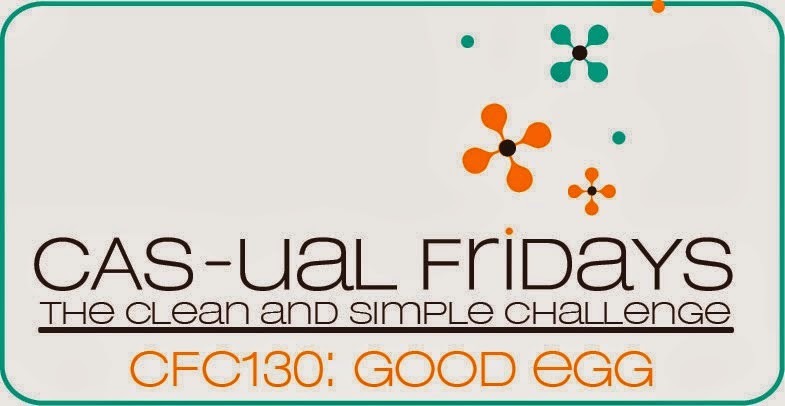 Have a card that I made last night for a couple of challenges: CAS-ual Fridays: Good Egg (use ovals) and CAS(E) this Sketch. The tag-card was die cut using a Penny Black tag die. Two tags were cut, one scored about 3/4 of inch from the top and adhered together. I die cut some hearts using my PTI hearts cover plate and then stamped four with one of the designs from the PTI Happy Hearts set. I picked the design that most closely resembled a Celtic one to me. A strip of green patterned paper was cut to fit the tag and one edge punched, the stem was stamped and then the strip was adhered. The hearts were adhered to make a four leaf clover. Some green ribbon was thread through the hole and tied with black baker's twine. 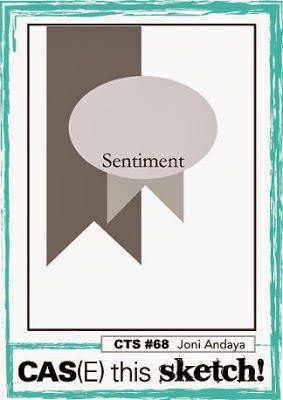 The sentiment (from the Taylored Expressions Wreath of Luck) was stamped on a small banner, adhered and a black sequin added. At the last moment I decided to add some Glossy Accents to the clover... gives it a nice shine! Hello friends!! 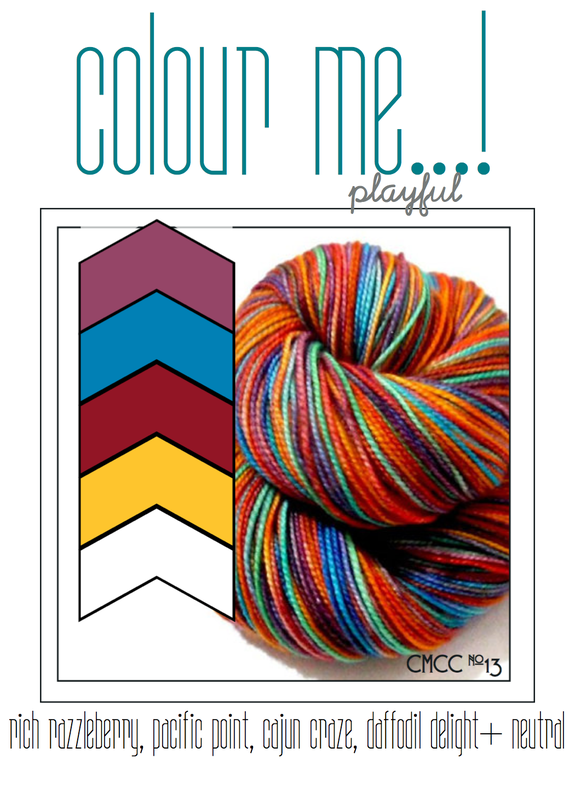 Wednesday is here and that means time for a brand new colour challenge at Colour Me..! The gallery was full of absolutely amazing projects last week! I know there will be just as many amazing projects this week using the fun color combo of Rich Razzleberry (dark berry), Island Indigo (teal), Cajun Craze (rust) and Crushed Curry (yellow). All the challenge information can be found at the Colour Me..! blog. For my card this week I decided to do some quilling. I pulled out some SU! designer paper that corresponded with the colors and created a flower using a quilling die from Quilled Creations. The leaves were also created using SU! designer paper. The layout is based on last week's My Favorite Things Wednesday sketch. The sentiment is from the Precious Remembrance Shop set Positive Thoughts. Including a photo of a close up of the flower so you can see it a little bit better. Thanks for stopping by...please check out the projects created by my fellow teamies Tara, Hayley, Sam, Katie, Brenda and March guest designer, Michelle! Hello friends!! 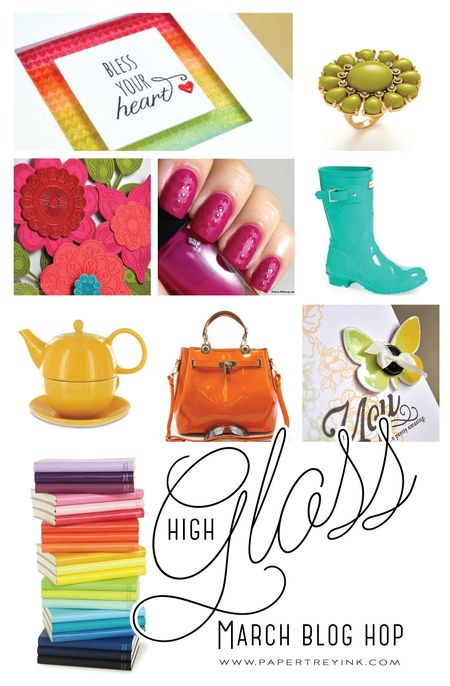 Here with my card for this month's PTI hop: High Gloss. I had originally thought I would give Glossy Accents another try, but ended up doing some tone-on-tone clear embossing and using enamel dots. I have a love hate relationship with Glossy Accents. I love the look, but hate trying to get the stuff out of the bottle and on to my project without making a mess. And sometimes the problem comes in just trying to actually get it out of the bottle! So I gave up on it, but this month's PTI hop got me thinking I would give it another try. I bought a small bottle and so far the two times I used it there wasn't a problem. Fingers crossed that when I finally try it on a project it works! Anywhoo... back to my card, lol! I used the PTI sets Lovely Layers and Distressed Stripes and a bright spring like color combo of yellow, pink and spring green. The enamel dots are from My Mind's Eye. Decided to try skewing the panels and I quite like how it looks. Hello friends!!! The sun is shining here in my corner of the world, but unfortunately the rain is due back in the next few days. After that huge landslide that occurred north of where I live I'm hoping that the rain holds off. The pictures of the destruction are just stunning. My heart goes out to everyone touched by this disaster! I have a quick card to share. I found out this morning that my super sweet and very talented bloggy friend, Judy, is going to be one of the guest designers for the Precious Remembrance Shop April release and I couldn't be more excited to be working with Judy, again!! She has an amzing card that she made for the PRS guest designer call posted on her blog and it inspired me to get out several of my PRS sets and make this little card. I used the current Dynamic Duos color combo of Rich Razzleberry, Soft Sky and Pale Plum. I used my favorite PRS set "DIY" along with a sentiment from the PRS set "Thanks". After stamping all the images I tied on some black baker's twine and added a few clear rhinestones. Supplies: Cardstock: PTI Rustic White; Stamps: Precious Remembrance Shop; Black Baker's Twine, Clear Rhinestones; Ink: SU! 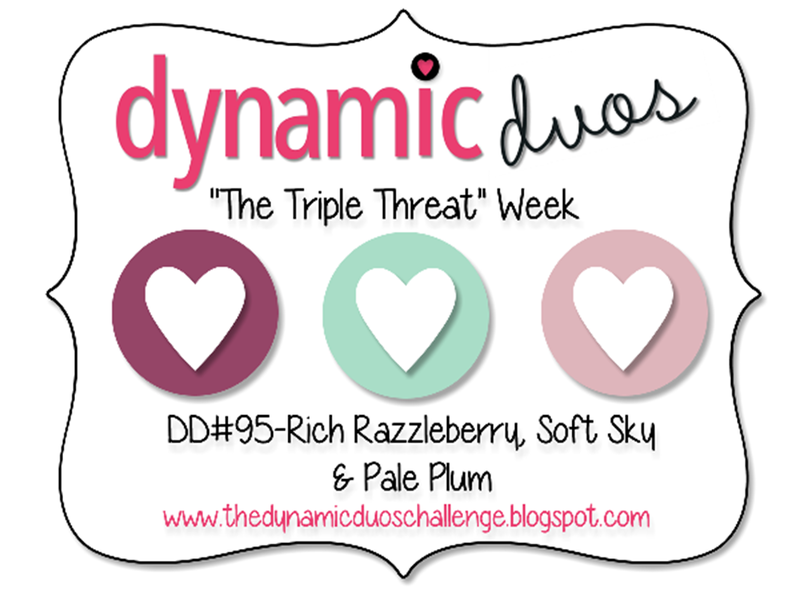 Rich Razzleberry & Soft Sky, PTI Plum Pudding. Hello friends!! Yep! It is a beautiful day here in Western Washington! Course, that means tomorrow will probably be crappy... but tomorrow hasn't come yet so I will be content with today's beautiful!! Have a couple of cards for several different challenges to share. Both are very clean and simple... my favorite kind! First up is a card I made using the current color combo from Reverse Confetti and the current CAS(E) this Sketch layout. 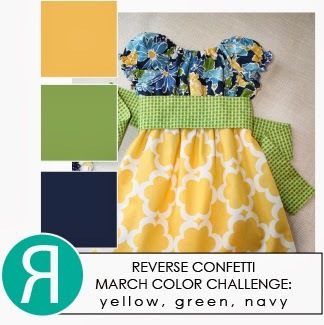 The RC combo is navy, yellow and green. I pulled out my RC Peacock Pretties set and got to work. The little banner is also an RC product and was the perfect fit for the sentiment from the RC set Paper Cranes. A few My Mind's Eye Enamel dots finished things off. 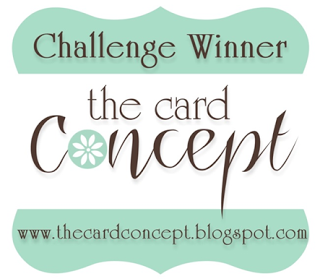 The second card is for the current ColourQ challenge. 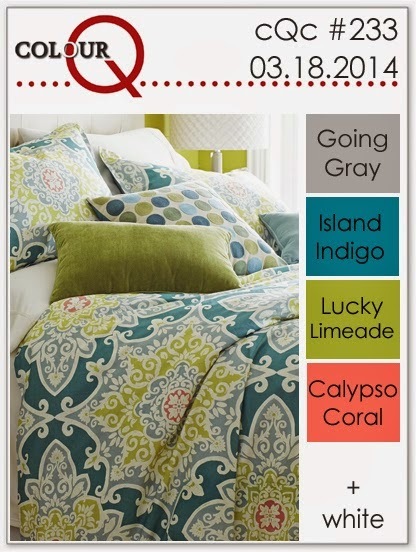 The combo this week is grey, lime green, coral and bright indigo. 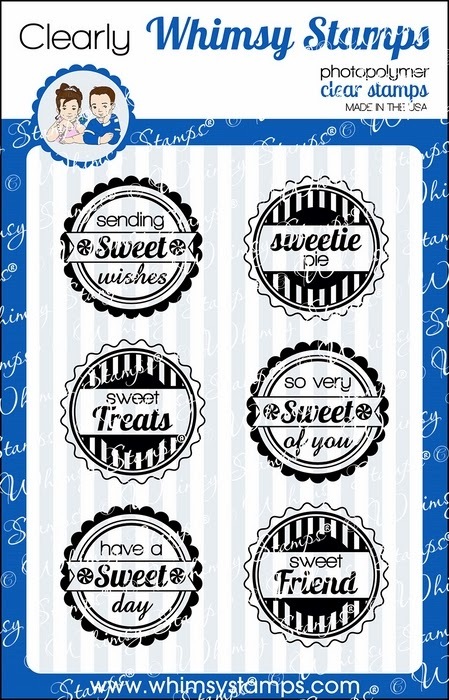 I used the super cute (and newly release... find the stamps and dies here) Clearly Whimsy stamp sets Sweet as Candy and Sweet as Candy Sentiments, as well as the matching lollipop and large word die. 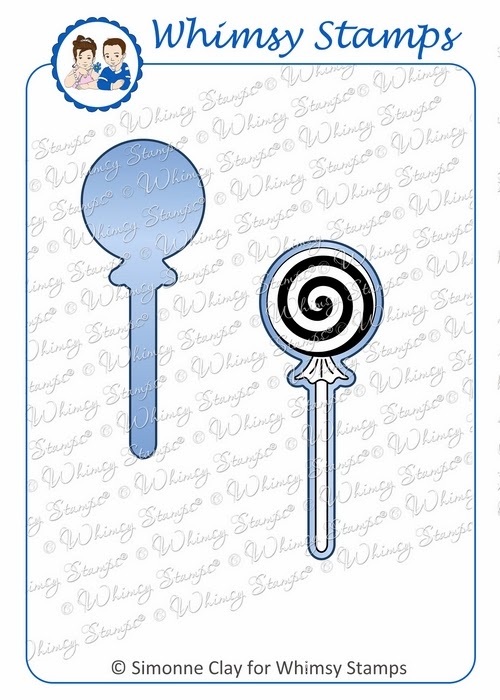 I die cut the lollipops and then stamped each one with grey ink and the lime, indigo and coral inks. The word was die cut, stamped with grey in and then coated with Wink of Stella silver ink. I have included a second photo that shows the subtle sparkle that you get with a Wink of Stella pen. The sentiment was stamped in black... sweet and simple! Going to pop this one into the current Simon Says Stamps Wednesday challenge: Glitter It. Hello friends!! Can't believe how quickly time is flying by... March is almost over! Yikes!!! 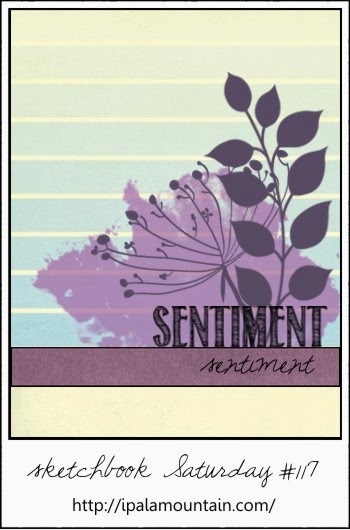 Have a card to share that I made using Verve's Viva La Verve March Sketch #2. I'm also going to pop this into this week's CASology challenge. 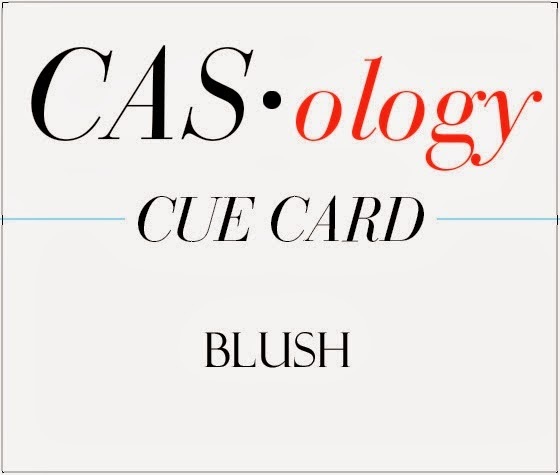 When I saw the cue word "blush" I initially thought I wouldn't be able to come up with something, but as the day progressed I hit on an idea... hope you like it. A few months back I bought the Penny Black "rose" die. I tried using not long after I got it, but my effort ended in dismal failure. So I put the die way for another time... today! Can you see where I went with the cue word? I die cut the rose from white cardstock and then added a blush of color to the rose with two Copic markers: RV00 and G40. To keep things soft I used light pink and green cardstock, as well as vellum. The sentiment is from the Verve set "On Occasion". After layering everything up I added a few blush pink sequins. Here is a close up of the rose. Hello friends!! 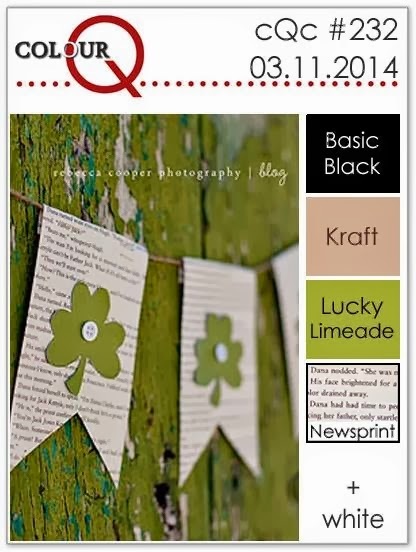 It is Wednesday and that means time for a brand new color combo over at Colour Me! 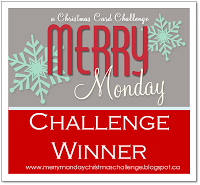 So many fun entries for last week's challenge! 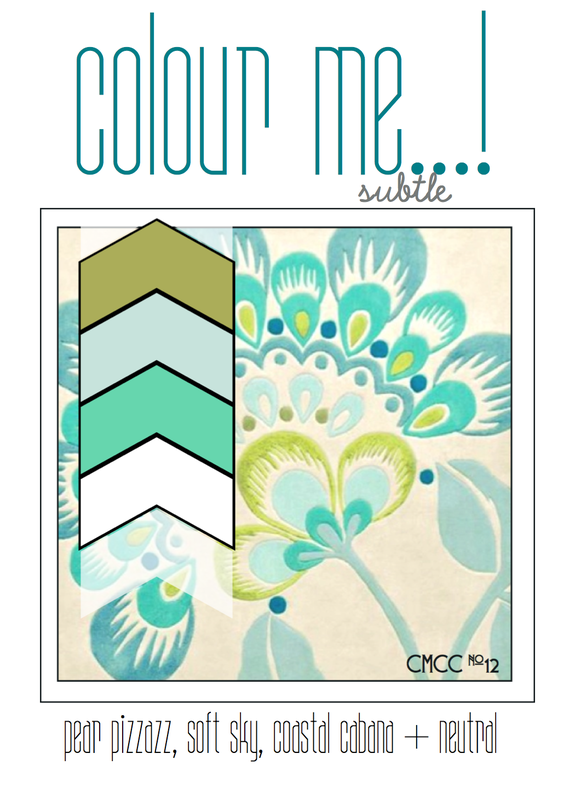 I think you will really like this week's soft and subtle combo of light green, light blue and light turquoise. 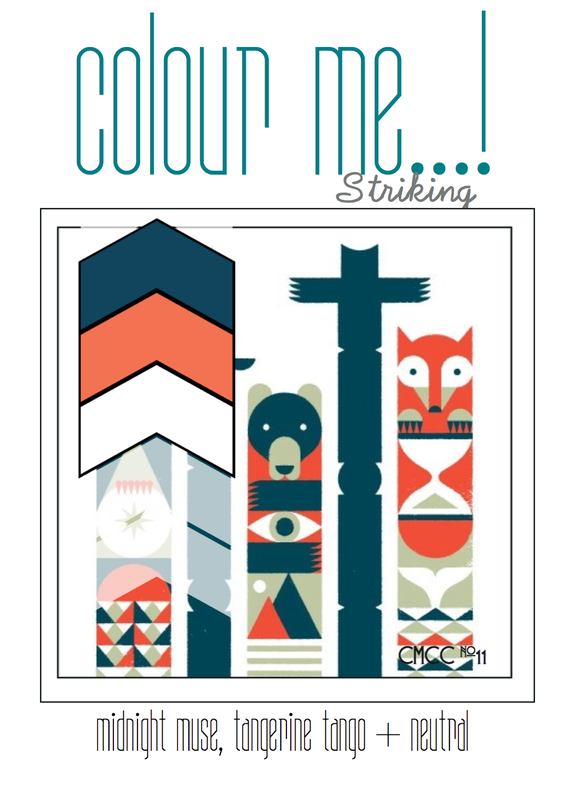 All the details can be found at the Colour Me...! blog. Sunday I got a chance to make a stop at my favorite stamping store, Impress Rubber Stamps, and picked up a few things. One of them was this lovely Impression Obession feather die and well... I was dying (ha!) to use it! This was a quick card to put together... die cut the feathers from the color challenge colors, adhere to the white cardstock piece, add the sentiment (from the Avery Elle set Love Notes), adhere the hemp twine bow and I was done. Oh... I rounded one corner, too. Thanks for stopping by... please check out the projects created by my fellow teamies Tara, Hayley, Sam, Katie, Brenda and March guest designer, Michelle! Hello everyone! Here with a birthday card for a lovely bloggy friend, Anita. Her birthday was actually last month, but Bev though it would be nice to have a little linky party for her. I don't normally join in these birthday party links (for various and sundry reasons), but Anita is such a sweet bloggy friend that I just had to join in to wish her a very happy (but belated) birthday! So last night I got out my Copics (haven't used them in ages!) and colored up this image from the Taylored Expressions Stargazer Lily Bouquet set. After I finished coloring the image I trimmed it out. 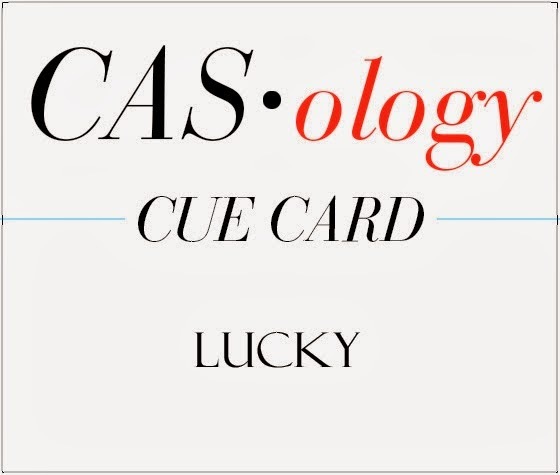 The layout for the card is based on the current CAS(E) this Sketch layout. For a bit of drama I decided to cut my banner from some black and white polka dot paper. 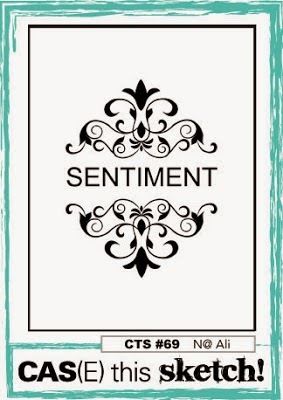 The sentiment (from a different TE set) was stamped on a little tag die cut using the PTI Tiny Tags die. I adhered that and added the pink twine bow. Finished things off with some pink and clear sequins. Hello friends!! We are getting soaked, again, here in Western Washington! 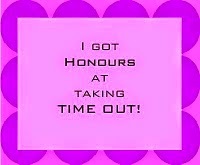 Unfortunately that is the way it goes around here in the spring, lol!! 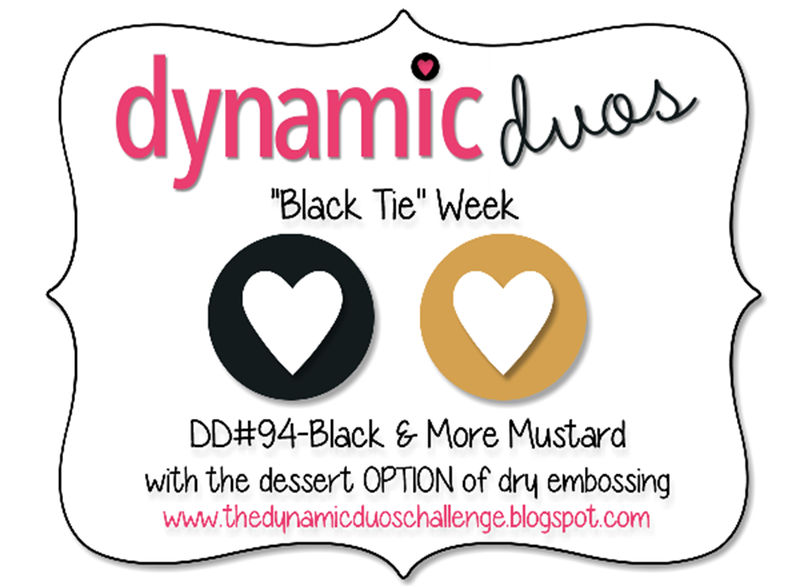 Got a bit of time to make a card for this week's Dynamic Duo (black & more mustard). I even fit in the dessert option of dry embosing. The layout is based on the current layout from Sketchbook Saturday. My card was very definitely influenced by the gorgeous card Chupa made. I combined the splatter stamps from SU! 's Gorgeous Grunge with the Hero Arts oldie, but goodie Three Ferns stamp and did one of my favorite things to do: collage stamping. A strip of More Mustard cardstock was wrapped with some black twine and the "birthday" was stamped in black. The "happy" die cut in black and adhered to the strip. The top corner of the piece was partially embossed using the SU! Decorative Dots embossing folder. Then the piece was mounted on a More Mustard card base. I think this makes for the perfect masculine birthday card. When I think of spring I always think of all the sweet little birds I see flying about and cherping in the trees... not the starling, though! They are so annoying, but the cute little chickadees. So I got out my Memory Box Perched Reed Bird die and cut a little birdie from some BasicGrey Serenade papers. I used two Verve sets, Poppy Birthday (sentiment) and Unto Us (label), for the card. The label was die cut using the Verve Classy Label die and then stamped with the corresponding image from Unto Us in yellow ink. The sentiment was stamp using dark brown ink. The background paper and banners were cut from additional Serenade papers. I distressed the edges for a slightly shabby look. Hello friends!! The weekend is almost here! We have had some lovely weather the last few days, but unfortunately it looks like it will be back to rain by tomorrow! :( Oh well... that is Western Washington, lol! Anywhoo... I do have a card to share. 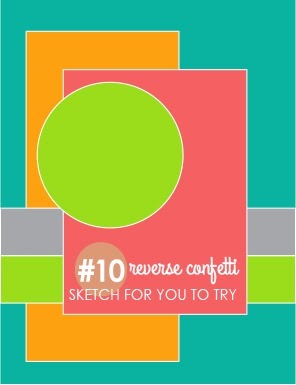 I made this little number for the current Reverse Confetti (SFYTT #10) sketch and ColourQ. In an effort to slim down the number of layers on my card, but still keeping the sketch layout intact I decided to try embossing the bottom layer onto my cardstock instead of using cardstock or patterned paper. And I absolutely LOVE the results! Give it a try... you might like it, too!! So for this card I embossed the long rectangular piece using a Spellbinders Long Rectangle die. Unfortunately, I see that it is a bit hard to see in the photo. (Added a detail shot.) Additional cardstock and patterned paper was die cut using my regular Spellbinders rectange dies and layered. A strip of black cardstock was cut, one edge punched with a scalloped edge punch and a strip of green cardstock layered on top. I adhered that strip and then layered on the other elements, including the paper crane that I stamped on "newsprint" patterned paper and trimmed out. Hello friends!! It's Wednesday and that means time for a brand new Colour Me...! combo! This week is a really fun one: navyish (is that a word??) and orange. I have to admit I was a bit intimidated by this combo, but I think I reached a good balance with my card. You can find all the challenge details here on the blog. 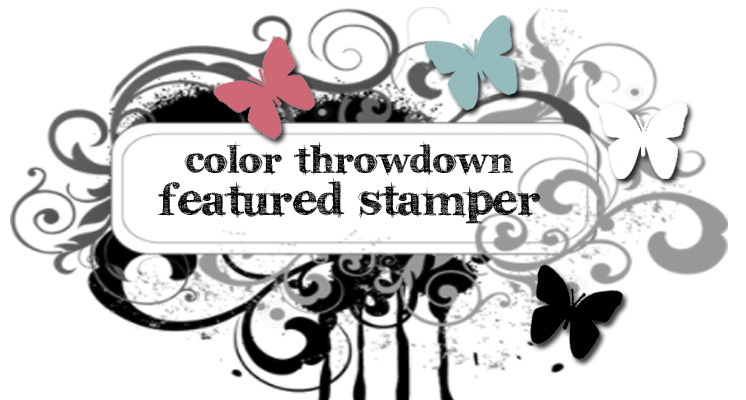 I pulled out my Stampin Up! "oh, Hello" stamp set, as well as the Hero Arts set "Antique Butterflies & Flowers". When I am confronted with a color combo that I find a bit intimidating I have a tendency to go with stamping instead of trying to combine patterned paper or cardstock. I find that I'm able to achieve a better balance on my card that way. 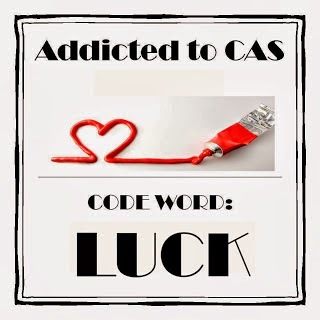 Give it a try and see if it works for you. Once, again, I used the lighter of the two colors (the orange) as more of a background for the darker navy color. Whimsy Stamps Debut Day 2!! Hello friends!!! 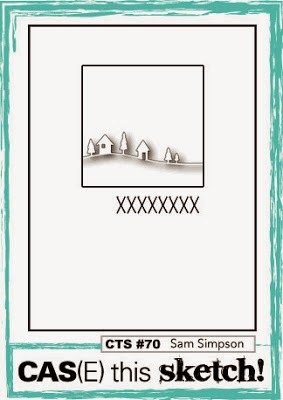 Remember when I told you on Friday that Whimsy Stamps would be debuting a new line of stamps??? Well... today is the day!! YAY!! 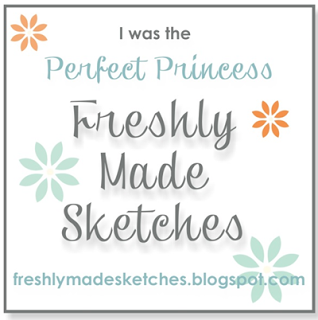 I finally get to share the projects I made with this fun new line of stamps. 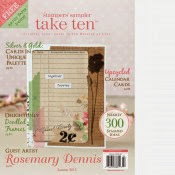 You can read the announcement here on the Whimsy Stamps blog. To celebrate the release Whimsy Stamps is having two days of blog hops leading up to the release day blog hop on Wednesday March 12th. If you got here from the blog of the super talented Michelle, then you are on the right track. If not, head to the Whimsy Stamps blog for the full list of participating blogs and start at the beginning. Make sure you stop at each blog on the hop as there is a chance to win $15.00 gift certificate to the Whimsy Stamps store. Today I'm sharing a card that I made with the Sweet as Candy Editions set. 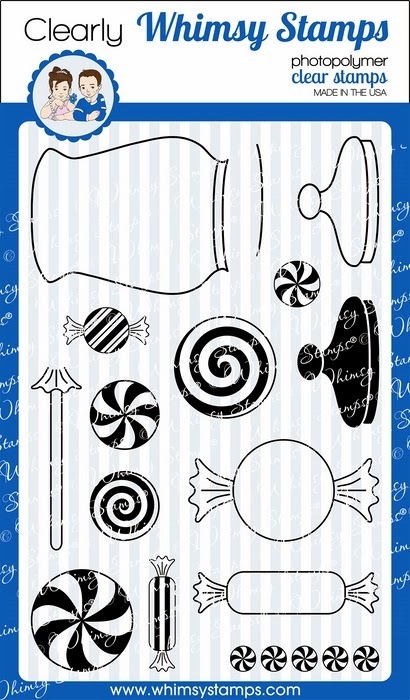 This is a fun set of circular sentiments that fit perfectly inside the lollipop die or the large candy die. For my card I decided to stamp one of the sentiment on a circular wood veneer embellishment. I stamped the sentiment in red on the embellishment and then to continue the red/kraft theme I die cut a red circle from cardstock and a larger one from burlap. I layered everything and adhered it to a kraft cardstock piece that was embossed using a piece of burlap. A bow made from kraft and red twine finished things off. Thanks for stopping by... don't forget tomorrow is release day and there will be a final blog hop to celebrate. There will be a chance for two lucky hoppers to win a prize!! Hello friends!!! 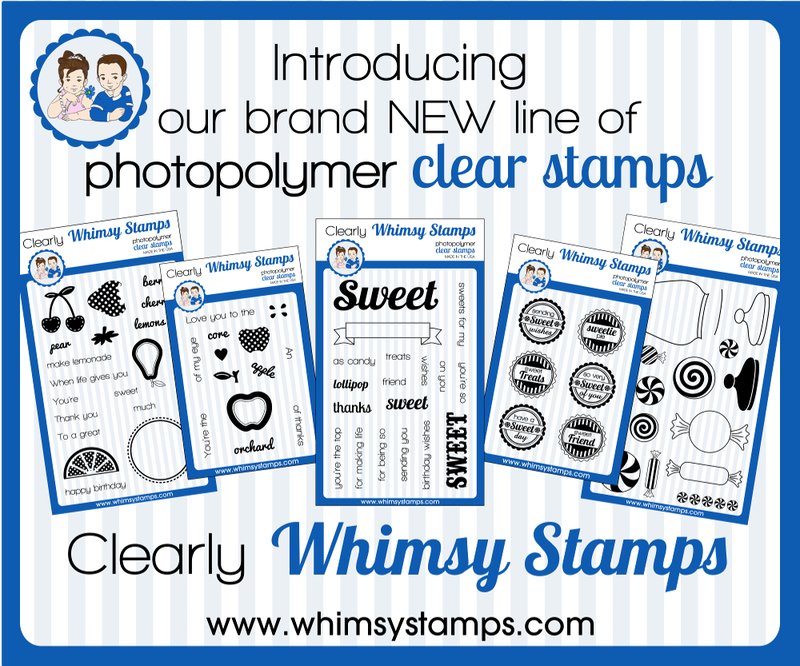 Remember when I told you on Friday that Whimsy Stamps would be debuting a new line of stamps??? Well... today is the day!! YAY!! I finally get to share the projects I made with this fun new line of stamps. 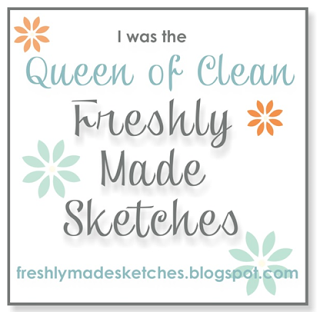 You can read the announcement here on the Whimsy Stamps blog. 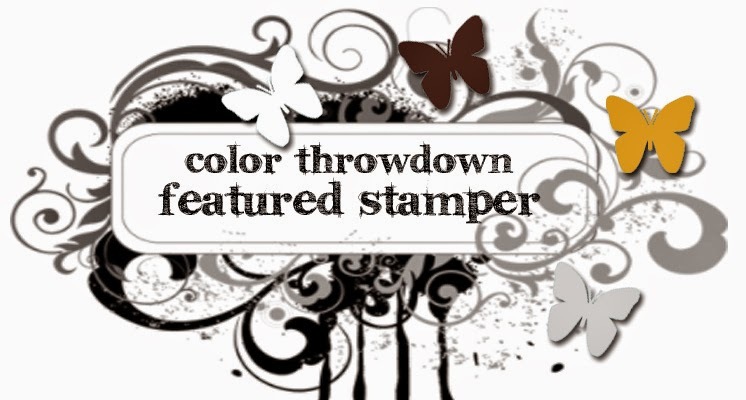 To celebrate the release Whimsy Stamps is having two days of blog hops leading up to the release day blog hop on Wednesday March 12th. If you got here from the blog of the super talented Michelle, then you are on the right track. 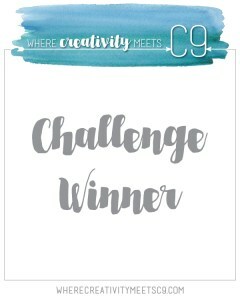 If not, head to the Whimsy Stamps blog for this list of all the participants and start at the beginning. Make sure you stop at each blog on the hop as there is a chance to win $15.00 gift certificate to the Whimsy Stamps store. Today I'm sharing some cards that I made using the soon to be released Sweet as Candy and Sweet as Candy sentiments sets, as well as the Sweet as Candy large word die and Sweet as Candy lollipop die. First up is a card that I made using both the lollipop and word dies. I die cut three lollipops from white cardstock and then stamped each on with different colors using the corresponding stem and center images. The lollipops were adhered to together and then attached to the card base. 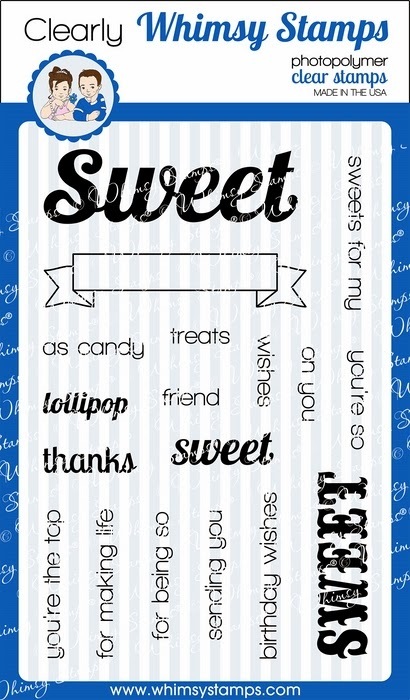 I die cut the word from patterned paper, adhered it over the lollipops and then stamped the "thanks" sentiment. The second card was made using the candy jar image and two smaller candy images, as well as a large candy image. 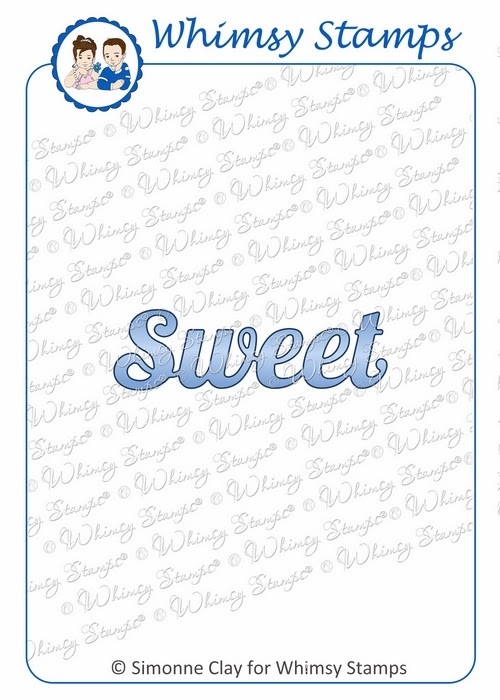 I die cut a banner and stamped it with the word "sweet" and the sentiment "birthday wishes. Adhered that over the card along with the larger candy image. For some additional interest I partially embossed the top portion of the white panel with dotty embossing folder. Here are images of each of the stamp sets and the dies. Your next stop on the hop is Sylvia's blog. I know she is going to knock your socks off with an incredible project. Thanks for stopping by... don't forget to stop by tomorrow for more sneaks and another chance to win! !